Home › Basketball Plays › "Michigan"
We run this play from our basic 3-out, 2-in motion offense. O1 is point guard, O2 and O3 are the right and left wings, and O4 and O5 are the right and left low post players. This can be run in either direction, right or left. The first pass from the point guard determines the direction of the play. 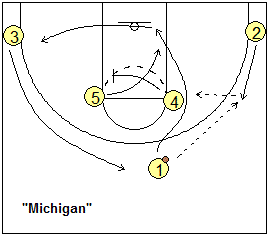 O1 calls "Michigan", and immediately the two post players move up to the elbows and the two wings drop down into the corners. When everyone is set, O1 yells "Go" and O2 cuts out toward the wing to receive the pass from O1. The ballside post (O4) immediately moves over to screen for the opposite post (O5), and to make spacing for the cut by O1. O1 makes the basket cut, looking for the pass from O2. If the pass is not there, he/she moves out to the opposite corner. O3 moves out to the point as soon as O1 vacates the point. O4 has set the screen for O5, but O5 delays until after O1 has already cut through (otherwise if O5 leaves too soon, O1 and O5 will collide, with no spacing). After O1 cuts through, O5 cuts hard off the screen to the ballside low block, looking for the pass from O2. O2 has several options: pass to O1, pass to O5, shoot the 3-pointer, or drive his/her man. If O5 does not receive the pass, he/she can optionally set a backscreen for O2.